Many types of material are exothermic without exposure to an external stimulus. Their internal temperature can increase to the point where they begin to burn spontaneously. The resulting fire and intense heat can cause nearby material to ignite. Ultimately an entire warehouse or storage area can be destroyed. Although warehouses and storage areas are equipped with fire alarms and fire-fighting systems, these systems only start to operate when a fire already exists. 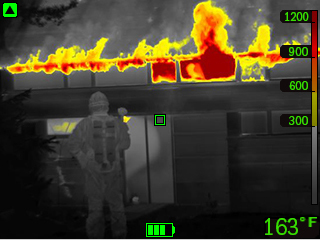 Thermal imaging can help to detect hot spots before a fire occurs so that the necessary measures can be taken. Bulk storage of any combustible materials leads to fire risk in many large storage areas such as waste bunkers, wood or paper stockpiles, as well cement and coal storage yards. Self-ignition usually starts within the bottom layers of a stockpile as a result of temperature increases in the material. By continuously monitoring the surface layers, hot spots can be detected in an early stage and action can be taken for fire prevention. To transport the coal to the boilers a conveyor belt system of several kilometers in length is used. During the transport the chance of spontaneous combustion is even higher than in storage facilities where the coal lies still. When the bituminous coal ignites the fire would not only be dangerous for the plant's personnel and likely destroy part of the conveyor system, it would also cause power generation to come to a complete stop. Any industry which has some type of storage area where goods or material is kept is susceptible to self-combustion of material. Typical examples of this are storage of splint wood, batteries, waste recycling materials and coal. All these applications have a fundamental need in common to detect hot spots for fire prevention.